In my continuing quest to make our whole wheat baked goods healthier and more easily digestible, I started making the soaked healthy pumpkin muffins from Kitchen Stewardship about a year and a half ago. It’s been a long time since I made Spiced Nutty Pumpkin Muffins because we think that these are even better than those (plus these are soaked!). I’ve changed the recipe fairly significantly – primarily by doubling it (because who wants only 12 muffins? ), upping the pumpkin, cutting the water, drastically reducing the sugar, and increasing the spices and vanilla. Also, I’ve come up with an applesauce version. I’m still experimenting with reducing the oil a bit as they can be on the greasy side. So I’ve put the oil amount in a range. Generally, I use the full amount and it is delicious. But I think that it could probably be cut by a bit and still be good. I clearly forgot the mini-loaf in the oven for this particular batch – don’t aspire for that dark brown color! Mix well, cover, and let sit overnight or up to 24 hours. Mix into the flour mixture, until fully combined. This is most easily done in a stand mixer. Add to the bowl and stir until combined. Grease two muffins tins and two mini-loaf pans (or one regular loaf pan). Don’t over-fill the muffin cups – two-thirds full is sufficient. Whatever remaining batter you have can be put into the loaf pans. Bake at 325 for 20-30 minutes, slightly longer for the loaf pans. The muffins should be just slightly springy to the touch but mostly solid. Try not to over-bake them, for maximum moistness. After taking them out of the oven, let them cool for at least 10 minutes before attempting to take them out of the muffin tins. They’re fairly fragile when they’re warm so they need to cool a bit or else they’ll break on their way out. Ellie knows the “it breaks, we eat it” rule so usually she’s rooting for broken muffins! I use a wooden chopstick to help me pry them out of the tins. Use 2 ½ C (678 g ) applesauce** in place of the pumpkin and 1 tsp ground allspice and ½ tsp ground cardamom in place of the ginger and cloves. I also prefer to use walnuts in the applesauce version rather than pecans. Storage – These keep really well in the freezer. *When I really have my act together, I measure the oil, chop the nuts, measure the dried fruit, and combine the sugar, salt, baking soda and powder, plus spices the night before. That way, in the morning, all I have to do is add the eggs and vanilla to the sugar/spices and then mix everything together. This makes for a much easier baking morning. I make my own pumpkin puree and applesauce every fall. I don’t strain my pumpkin before freezing and I don’t add water when making applesauce. Therefore, my pumpkin is more watery than canned pumpkin and my applesauce may be thicker than commercial applesauce. My weight measurements above are how much 2.5 C of my pumpkin and applesauce weigh. You may want to use the volume measurement the first time and weigh your pumpkin/applesauce to know exactly how much yours weighs, if you intend to use the weight measurements. If you’re using canned pumpkin, you could use the whole can of pumpkin and then add enough water to equal 2.5 C if you don’t want to use part of a second can. One final note – if you don’t want to bother with the soaking and just want to make pumpkin muffins, then you should use my other pumpkin muffin recipe rather than just skipping the soaking step in this recipe. The leavening in particular is designed to worked with the soaked whole wheat, which behaves different than non-soaked flour. Rather than modify this recipe, just use my other one. They’re delicious too! 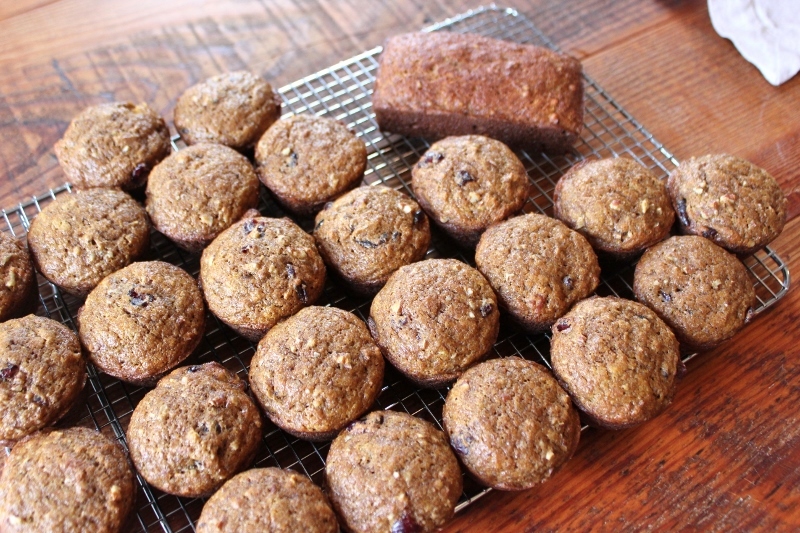 This entry was posted in cooking, recipe and tagged pumpkin muffin, soaked whole wheat. Bookmark the permalink.